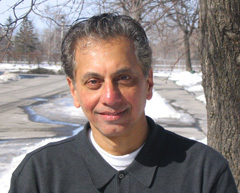 Cyril Dabydeen has written eight books of poetry, five of stories, and three novels. He also edited A Shapely Fire: Changing the Literary Landscape and Another Way to Dance: Contemporary Asian Poetry in Canada and the U.S. His poetry and fiction have appeared in over 60 magazines in Canada, the U.S., the U.K., Australia, Asia and the Caribbean, and anthologized in over 20 volumes in seven countries, including in Best Canadian Short Stories (Oberon) and Caribbean New Wave: Contemporary Short Stories (Heinemann). An editor of theJournal of Caribbean Studies (US), his most recent books areUncharted Heart: Poems (Borealis Press) and Drums of My Flesh: Novel (long-listed for the IMPAC/Dublin International Prize, co-winner of Guyana Prize for Fiction, and finalist for the City of Ottawa Book Prize). He juried for Canada’s Governor General’s Award for Literature (Poetry) and the Neustadt International Prize for Literature (University of Oklahoma) in Year 2000. He has read from his books across Canada, the US, UK and Europe, the Caribbean and Asia. He currently teaches English at the University of Ottawa, Canada. Poetry came to me almost naturally, I suppose. No, there’s no specific moment really that I can recall; but I did begin writing in my early teens: that I do know. I don’t find or look for inspiration in any special way. Maybe it has to do with the mood one is in; and reading a book or being in a quiet place, or taking in a particular scenery could inspire that mood. More than anything else, for me, it is solitude that helps me to bring about an inspired feeling. With each writer I think it may be different, and it’s what makes us all unique as genuinely creative beings. I work with an image, mostly: something that comes to the mind or which touches one’s feeling, or what I might have seen, or something I might recall. With the latter I tend to go back into memory. Memory is the mother of the imagination, the mother of the Muses, as has been said. Also, a particular word can trigger something in me, even inspire an image, and that sets things off more or less, and I take it from there and see where it goes. But the key word, is that it is a process; only occasionally something may come in one fell swoop, so to speak, if one is lucky. I revise endlessly. I feel I must get things right, with the inner ear and sense most of all when it comes to poetry: the way the lines appear, where to make line-breaks, and finding the right words to say exactly what you want to say, with the keen sense of metaphor and being able to capture a genuinely felt experience, which itself can be elusive. And if I haven’t gotten it correctly, then I will put the draft poem aside and allow a fallow period to take over. Then I may go back to the poem later, a week or two or longer, and try to improve on it. Distancing myself from the first few drafts is also key, an integral part of my overall process. A first draft can have too much heat, or the words may not be right, so you have to go at it again. Writing poetry is hard work and demands your utmost concentration, I think. I do remember that when I was about ten years of age I had written a poem as a class assignment, a kind of oneoff thing—not a usual classroom exercise; and the teacher was pleased by my effort, it seemed, more than of the other students’ work. She immediately took the poem to show it to the headmaster. Now he was a stern-faced man, often unapproachable—an old-school kind of headmaster in then-British Guiana where I was born; and I do remember feeling somewhat awe and thrilled too, when he smiled as I watched him a few yards away, and he might have admired my poem, I think. That’s all I can remember, really; but it gave me a sense of something special, what one can do with words, what you can really create. I felt special then, see. Not really. But I do have a dictionary close at hand, on my desk. I consult it ever so often when I read and write. A dictionary is very important to have handy if you are serious about becoming a writer. Listening to a live poet, especially one who has published, is often enthralling; it gives you a sense of possibilities, too, where you can go with your own work, and indeed, where words can carry you if spend the time to work at it. Overall, listening to a live poet “acting” out his work makes things come alive on the page, with the cadence and emotional energy and words combined. At least that’s how I read my poems to audiences. Published in Emerging Scholars 2. Spec. issue of Canadian Literature 228-229 (Spring/Summer 2016): 52. Published in Queerly Canadian. Spec. issue of Canadian Literature 205 (Summer 2010): 85. Published in Black Writing in Canada . Spec. issue of Canadian Literature 182 (Autumn 2004): 65-66. Published in Auto/biography . Spec. issue of Canadian Literature 172 (Spring 2002): 39-39. Published in Canadian Literature 165 (Summer 2000): 25-25. Published in Canadian Literature 160 (Spring 1999): 71-71. Published in Urquhart and Munro . Spec. issue of Canadian Literature 150 (Autumn 1996): 106-106. Published in South Asian Connections . Spec. issue of Canadian Literature 132 (Spring 1992): 124-125. Published in South Asian Connections . Spec. issue of Canadian Literature 132 (Spring 1992): 58-59. Published in Paradigms of Doubleness. Spec. issue of Canadian Literature 104 (Spring 1985): 93-94. Published in Caribbean Connections . Spec. issue of Canadian Literature 95 (Winter 1982): 65-66. Published in Caribbean Connections . Spec. issue of Canadian Literature 95 (Winter 1982): 65. Published in Caribbean Connections . Spec. issue of Canadian Literature 95 (Winter 1982): 28-29. Published in Psychological Fictions: Myth, Carr, Lowry . Spec. issue of Canadian Literature 84 (Spring 1980): 40-40. Published in The Moral Novel . Spec. issue of Canadian Literature 80 (Spring 1979): 4-4. Published in Sources . Spec. issue of Canadian Literature 76 (Spring 1978): 97-97. Published in Sources . Spec. issue of Canadian Literature 76 (Spring 1978): 46-46. Published in Exiles and Expatriates . Spec. issue of Canadian Literature 73 (Summer 1977): 78-78. Published in Tracking CanLit. Spec. issue of Canadian Literature 220 (Spring 2014): 73. Published in Poets & Politics. Spec. issue of Canadian Literature 105 (Summer 1985): 158-159. Published in Nationalism . Spec. issue of Canadian Literature 75 (Winter 1977): 103-104.